At BlueStacks, we play games for a living; that much should be obvious if you’ve been following our blog. However, one of the best parts about this task is discovering the little quirks and features that make each game stand out among the rest. When it comes to mobile titles, most of them are very formulaic, to the point where we can actually predict what a game will be about by playing it for a few minutes. In a sense, you could say that we are a bit jaded in this regard. Nevertheless, we always keep an open mind when it comes to trying new things out, especially when the said things are games like Aurora Legend. Rastar Gaming’s newest title features a casual take on the traditional adventure RPG formula. This game has many features in place to distinguish itself from the others, including a vastly different approach to progression and gameplay. Specifically, the developers created the game with a focus on the busy crowd; for those who don’t have time to sit and play for long periods of time. In this sense, Aurora Legend sports lots of features that automate most of the gameplay, including battles, resource gathering, and even grinding. If you want to find out more, feel free to read all about this title in our review. Adventure games have certain aspects that help to identify them as such. 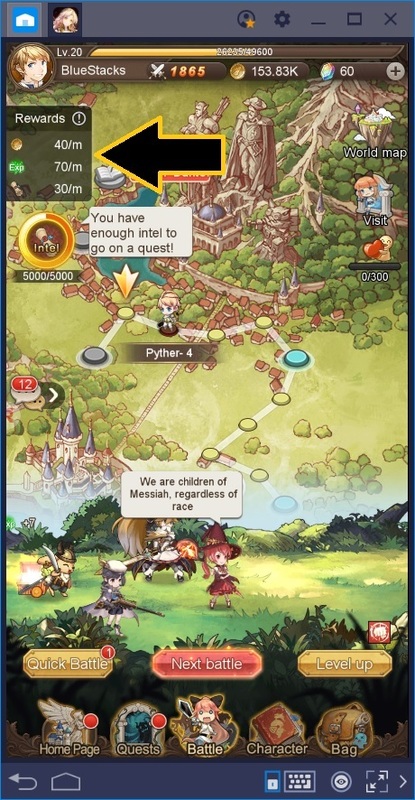 For adventure games in the mobile medium, specifically, there are certain aspects such as mission-based progression, team composition, and unit summoning that help to define them. In this sense, Aurora Legend is clearly an adventure game. However, there is one curious aspect about it that we were definitely not expecting when we came in. In other adventure games, the definitive way to farm for materials usually revolves around running the same missions repeatedly. In this manner, the player can receive a steady influx of rewards. 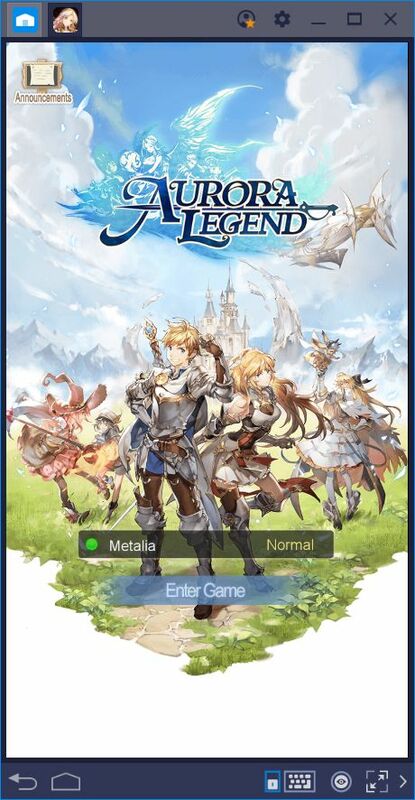 In Aurora Legend, however, there’s no way to repeat the stages that you’ve already completed, making grinding impossible in the traditional sense. Instead, your team is always battling against monsters in the field, even when you’re not playing. If you’ve been paying attention, you can see that the graphic in the map menu of your team fighting against monsters is for more than just aesthetics. Every monster that your characters defeats in this screen can drop gold, experience, or Intel. This system is akin to resource generation in RTS games, down to the form in which resource acquisition is represented on screen. On the far left, you can see a small window detailing how much of each resource you generate per minute. As far as we know, this production increases as you progress through the game and power up your team. This game is mostly about clearing stages to progress through the map. Every time you defeat the boss of a level, you can progress to the next stage where you’ll repeat the process until you reach a wall. However, some stages require a certain power rating to challenge and, even if you meet these requirements, you can still lose to a powerful boss. In this sense, having enough power doesn’t guarantee your success in this game, especially since battles are completely automated. While you can’t directly influence the result of a battle, your objective is to create a team of fighters that can take on any challenge. This means that you’ll have to micromanage each character, including increasing their level, equipping them with better gear, teaching them new skills, and promoting them, among other things. Consider yourself the manager of a soccer team: you can train the players, but they’re the ones that’ll step on the field and play the game. In this sense, the better your training and preparation, the higher your odds of success. Nevertheless, if you want a surefire way to improve your performance in this game, we recommend using the combo key and keymapping tool that BlueStacks provides. Read all about how to utilize these tools effectively in Aurora Legends in our BlueStacks usage guide. 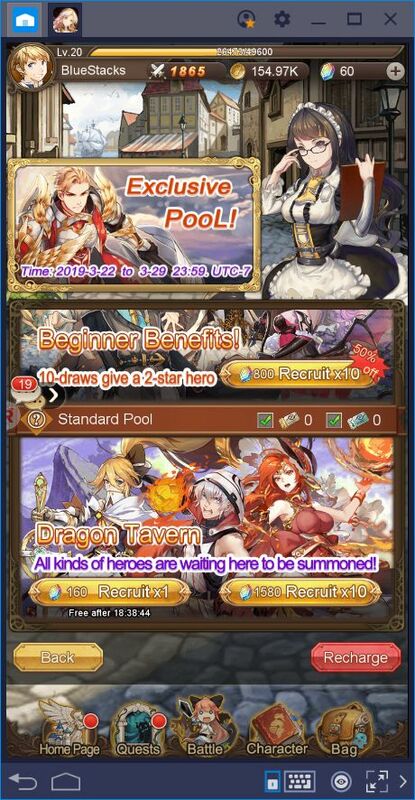 Good news for all our gacha fans! 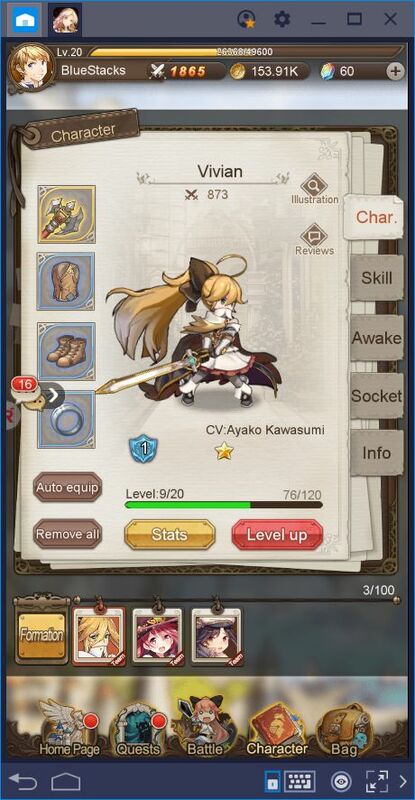 The reroll summoning in this game is very early. 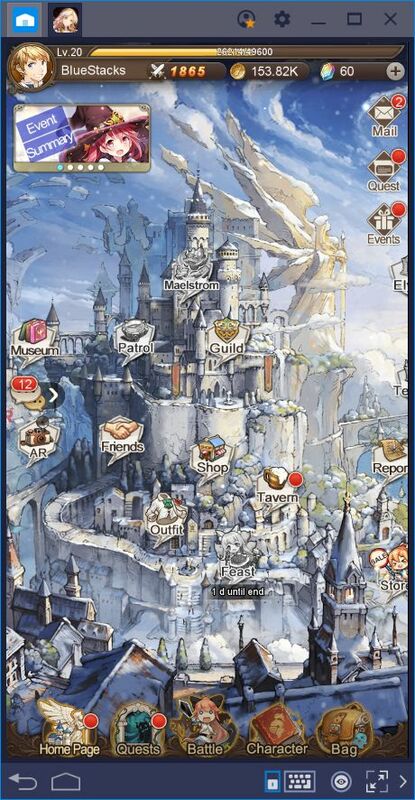 After completing a few stages and missions, you will receive your first 10x summoning ticket. As its name implies, this item allows you to perform 10 summonings that have a low chance of granting a hero, and a good chance of providing shards. We’ll talk more about the shards in a bit, but the heroes are the most important part of these summonings. If you’re not sure if you like the heroes that you receive from this first summoning, you can simply reset your progress and try again. Aurora Legend even makes it easy to reset as your progress is not saved after logging out if you haven’t linked your account. Before you start your first attempt, make sure to log in as a guest. 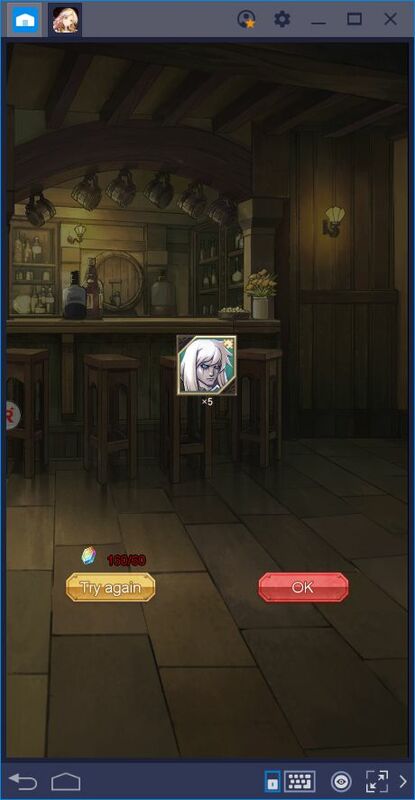 In this sense, if you’re not happy with your first summoning, you can simply log out and then start over as a guest again. 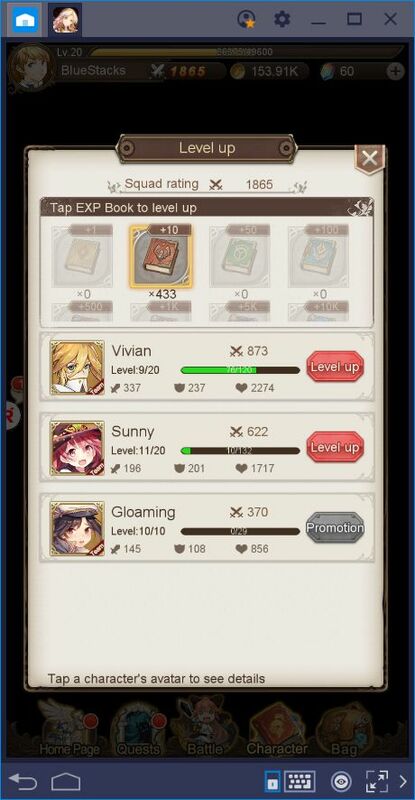 Once you’re satisfied with your initial summonings, bind your account using your preferred method to save your progress. In contrast with other gacha games, the drop rate for heroes with every summoning is quite low. Nevertheless, the game makes up for this with a high chance of receiving rare hero shards. Once you have enough shards, you can unlock the corresponding heroes and add them to your team. The shard requirements vary from unit to unit, so check your bag often to see if you have enough to activate a new hero. As we mentioned above, your characters are always defeating monsters and farming automatically in this game. In this sense, you’ll never have to worry about issuing commands or grinding manually. 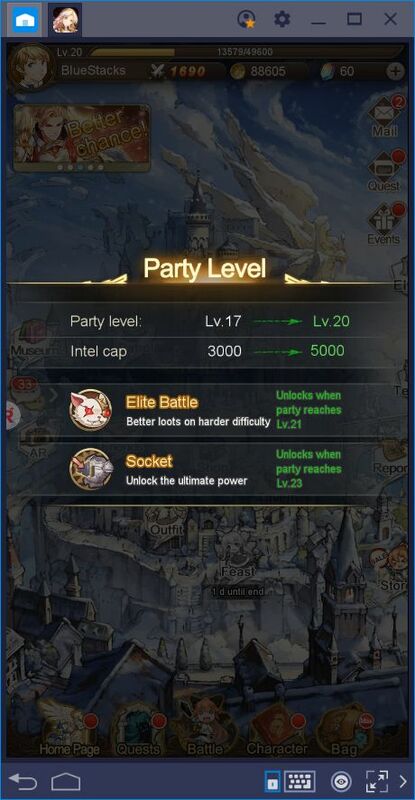 However, you can influence which items your characters receive from their auto farming. While your gold, exp, and intel influx remains constant in each stage, the secondary drops that you’ll receive from farming will vary according to the battlefield in which you’re stationed. 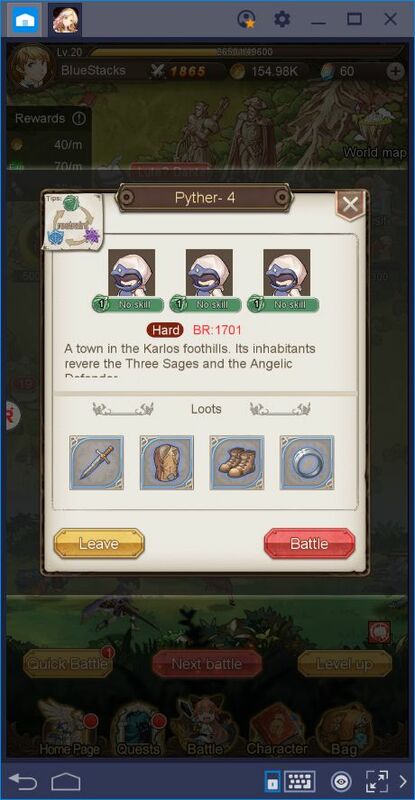 If you want to farm boots, for example, then you’ll need to station your team at a stage that yields the said drops. You can check the drops that you can receive from each stage by clicking on them. As a general rule of thumb, we recommend always leaving your characters at stages where they can grind for experience books. That way, you can log off for the night, and wake up to hundreds of books just sitting there waiting to be used to strengthen your characters. These are five of the most important things that you’ll need to pay attention to in Aurora Legend. As you can see, this game has plenty of aspects that help it to stand out among the others in the genre. With the information in this guide, you can now make the best decisions for your team.